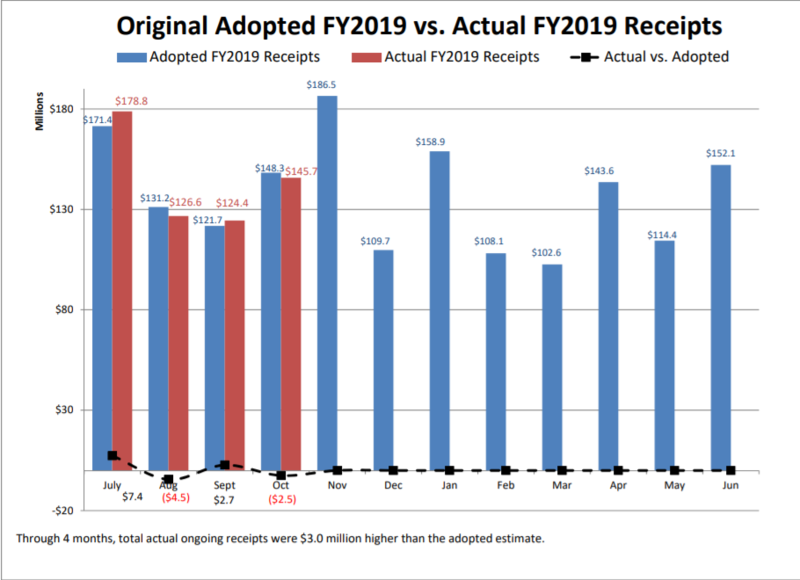 One-third of the way through the 2019 fiscal year and South Dakota’s revenue collection is ahead of schedule. Revenue collected through October – as reported by S.D. BFM – is nearly $3 million ahead of projections adopted by the South Dakota Legislature during legislative session this year. July and September collections were in the black $7.4 million and $2.7 million, respectively, while August was below projections by $4.5 million and October underneath the adopted estimate by $2.5 million. Sales and Use Tax collection is the highest grossing receipt thus far at $3.9 million above projection with the Tobacco Taxes collection underperforming the most with collection nearly $1.6 million below its projection. The positive performing Sales and Use Tax, and overall revenue collection, is a welcome sign after fiscal year 2018 collections were routinely subpar and subsequently resulted in K-12 education receiving a one percent increase in state aid compared to the 1.7 percent it should have received based on state law. With inflation expected to be at 2.3 percent, which would be the statutorily required increase in funding for school districts to receive, or approximately $20 million in new money, the uptick in revenue collection is a welcome sight. For updates on education issues, check the ASBSD Blog, Twitter feed and Facebook page.